I’m waiting anxiously for my beloved Green Zebra tomatoes to start ripening! I love this time of year when fresh vegetables from the garden are the first thing you consider when deciding what to cook. 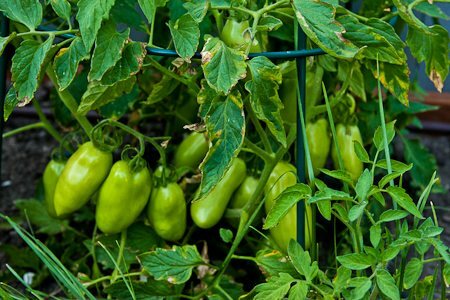 Of course the challenge of gardening is dealing with plants that produce more than you can use, while waiting eagerly for other plants that seem slow to ripen. Right now my garden is producing huge amounts of yellow squash, zucchini, cucumbers, green beans, chard, dark green kale and Red Russian kale. I’ve been thinking about how to use those plants, while at the same time I’m looking longingly at the tomatoes and wishing I’d start to see a few more ripe ones. 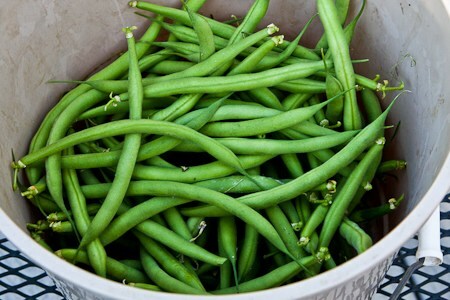 I’m picking this many green beans about every other day. If you have a lot of beans, I recommend The World’s Easiest Garlicky Green Beans Stir Fry or Green Bean, Tomato, and Feta Salad. This is Brandywine tomato, on the plant that was started by my brother-in-law in a greenhouse. I had a few early tomatoes from this plant and now I’m waiting for more so I can make tomato sandwiches! 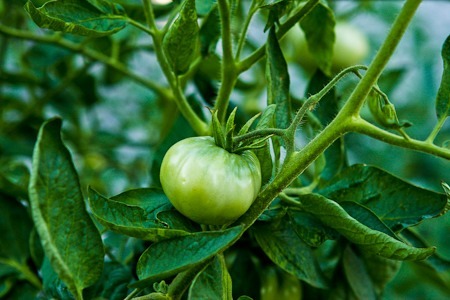 Celebrity tomatoes are a hybrid that grows especially well in Utah, and I always grow them for salads. 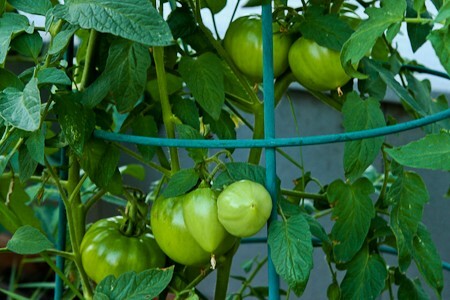 There are no ripe Celebrity tomatoes yet, but plenty of green ones. I like to pick the cucumbers when they’re on the small side, but my cucumbers are producing so many that sometimes they get away from me, like the one on the far left in this photo. 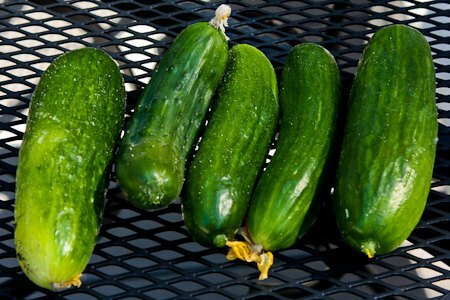 No worries though because those big cukes are great for making Tzatziki Sauce or Creamy Cucumber-Dill Sauce for fish. 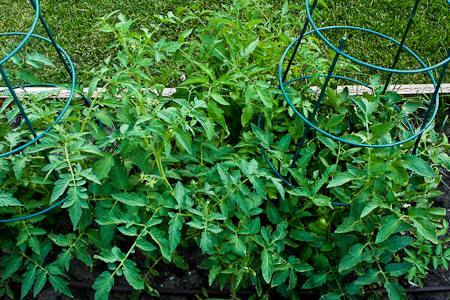 My Roma tomato plants are also loaded with tomatoes. I don’t know what’s causing the leaves to turn brown and curl up on the edges, but I figure it can’t be good! So far though most of the plant still looks healthy, so fingers crossed. 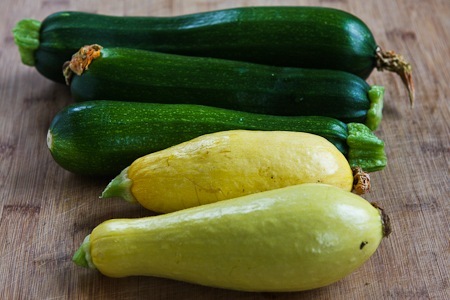 I used four of these summer squash to make Easy Cheesy Zucchini Bake, which might be my new favorite way to cook zucchini. The bigger one in the back was cooked on the grill for a new recipe I’ve been experimenting with. And finally, some people say never grow tomatoes in the same place two years in a row, but obviously I ignored that advice when I built tomato beds along my deck. I love having the tomatoes there, and my tomatoes are loving the sunny location so much that everywhere in the tomato beds I have “volunteer” tomatoes sprouting from the seeds of last year’s dropped tomatoes. In this photo the you can see the tomatoes I planted inside the green cages, but all ones between the two cages are volunteers. I’m not sure if you can see it, but there’s even a tomato on the volunteer plants. I did pull out quite a few volunteers, but after a while I decided to just let them go and see what I’d get! Each year is a little different in the garden, but it’s always fun watching things grow and experimenting with new ways to use them. You can see more 2011 Garden Updates or Garden Updates from earlier years by using the Tab labeled Gardening at the top of the page. If you’re growing a garden, please let us know in the comments about what you’ve been picking and how you’re cooking it! 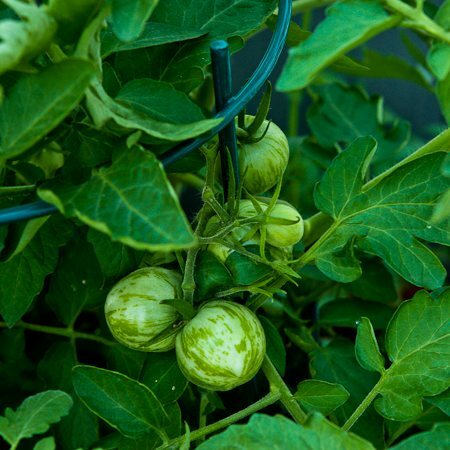 My Green Zebra plants are loaded with tomatoes now and I think I will have ripe ones in a few days! Everything in your garden is perfect! Zebra tomatoes are awesome. I just planted some of that yesterday. I just hope that it will turn perfect like yours. Love your garden. Rose Red, glad you're enjoying the garden updates. Now I'm very curious about what that was that you saw. I love your garden! I saw today something that tasted like tomato and look like a pepper! I love the zebra tomatoes aswell! Jeanne, I think I am going to continue to ignore it! 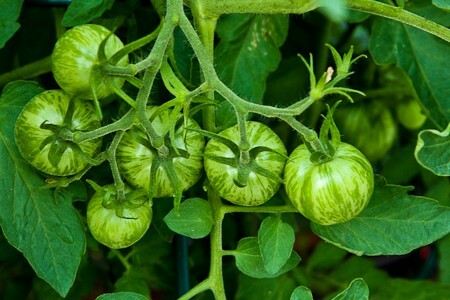 I am crazy about the Green Zebra tomatoes; can't wait until they're ripe. Lydia, last year I had scrawny little Romas, so I'm excited about the big ones I'm getting to make slow-roasted tomatoes this year. Nothing even getting pink here though, sigh. My tomato plants are loaded with tomatoes, but only one is getting close to ripe (I'm trying hard to be patient!). I grow lots of herbs, but no other vegetables, so it's fun to watch your garden grow through your photos. I'm looking forward to slow-roasting my own roma tomatoes in a few weeks. And of course that first ripe Early Girl will get sprinkled with sea salt and eaten on a slice of crusty bread. Sam, I have been growing a garden for about 30 years, so I have learned what works for our climate. This year Utah is having really odd weather, but so far the garden is still doing pretty well. What a lovely garden. We don't grow much other than herbs and a few tomatoes. We got a late start this year, so we're behind. I especially like your green Zebra tomatoes. Looks like you have a really green thumb. No pun intended. Shirley, I am completely sold on the Mater Magic. I will use it every year now. Tasha, I love them. I think they might be my favorite tomato. Those zebra tomatoes are going to be BEAUTIFUL!!! Thanks for that advice, will do it today! Kalyn, looks like your tomato plants have blight. Pick & discard (don't compost) the affected leaves so that it doesn't spread. The produce looks fabulous though! Maris, thanks. It's my favorite thing about summer. Nisrine, I'm definitely not as diligent about weeding as I used to be, but luckily with the raised beds I don't get as many weeds. The zebra tomatoes look lovely. Your garden is beautiful and looks well taken care of. No wonder it produces such awesome veggies. I am a amazed and very impressed with your garden. It's like a mini farm! Lindsey, that is sad about your zucchini. If only you lived closer I could give you some! Loving the beans here too! I have two kinds of beans this year. One is a bush bean and we've been picking every couple of days. Love them in salads and sauteed in a little oil. Nothing else has been ready except for a few onions, my Russian Red kale and my herbs. I cannot wait for tomatoes. It looks like I'm going to get a good crop.